Content generation can sometimes be a difficult thing for websites and blogs. As an internet marketer, one is in constant need of quality fresh and unique content. Marketers can write it themselves, but will soon realize that they will become slaves to the content. Another option is to pay to have it done, but this can lead to costs adding up too fast. What then remains is article spinning. It is difficult to complete a conversation about article spinning without talking about the best article spinner. One of the oldest tools in the field, it is rich in tools and offers some of the best results. Here is a general overview of the capabilities of the best spinner. Before starting the review, it is perhaps important to understand why one would need to use an article spinner. Even for the small amount of content, an article spinner can still save users a lot of time. Initially, it might seem like generating a spun article takes longer than the actual writing of a normal article. However, once one gets used to the process, they will find that writing a single article will take almost as long as it takes to produce as many as 3 spun articles. That represents massive time savings. The savings are even greater as the number of articles increase. One can easily generate as many as 100 unique articles from a spun article. The best spinner is essentially a text editor. It basically lets the user edit the article, but offers much more. It has a built in thesaurus, with thousands of synonyms for words and phrases. It is accessible to all the best spinner users, and is regularly upgraded. When editing an article, one can step through one word or phrase at a time. It provides a list of available options for words or phrases, from which one can either choose any or all the options provided. If one wants, they can also enter their own words as part of the spun content. After finishing with one particular phrase, one then goes to the other, doing this until they are done. Apart from the ability to manually rewrite phrases, the program can also automatically rewrite words and phrases. It might seem unlikely, but the program understands sentence structure enough to be able to completely make sentences and rephrase them in ways that still make sense. Combining the manual and automated spinning results in a super spun article. The program can also automate the entire process for those who do not wish to go through the process of choosing every single synonym. While using the program, one can also mark out their favorite synonyms and add them to a list. In future, when processing articles, one can filter them against these lists and replace all the occurrences with a single click. For those who choose to do the spinning annually, this feature is a clever way to speed up the process. Even for those looking to write an article from scratch, the best spinner tool has features that help the user do this fast. With an inbuilt thesaurus, a user is able to have the luxury of having the software work for their benefit through having an unlimited word bank to choose from. This gives flexibility when it comes to spinning since it gives the power of unique content generation which ultimately drives the hundreds to thousands of spins. 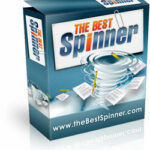 The Best Spinner offers its users the chance to edit the articles that have been spun in the manual setup. This is a unique advantage since it gives a user the ability to check for the uniqueness and identify any unnatural construction of sentences which may be flagged by Google as spam text. The inbuilt spelling and grammar checker is quite elaborate in its working and ensures that the spun content is not full of grammatical errors or spelling mistakes. This limits the time and effort that would have otherwise been spent in going through each text just to identify the errors. In the same wavelength, the spelling and grammar checkers are constantly updated so as to accommodate all the new words and varied spelling orientations. This feature is one of the standout elements of this software and its unique orientation is one which makes for a plus as far as user efficiency is concerned. With this feature, users can have the software spin the articles and post the same to the blogs of their choice which in turn saves time and ensures that the effort that would have been spent there is utilized on other internet marketing processes. With this feature, this software blows away the competition. The generate and compare function is effective in the sense that it allows a user to have the software generate content and in the same wavelength compare the spun content against the other resources that have been published over the internet. This not only gives authenticity but also limits the aspect of plagiarism which is normally penalized by search engines. The beauty with The Best Spinner is that it enables a user acquire backlinks easily and without much of a hassle. Through its posting orientation, the software is able to trace an acquire backlinks from the article directories therefore ensuring that increased traffic to the site of the user is achieved seamlessly. With this software, a user will never have to worry about their content or spelling and grammar being outdated since the constant updates ensure that every aspect of the spinning process is updated to the latest feature available. This gives an effective balancing process when it comes to spinning. The automatic rewrite of sentences that have been found to be duplicated is a feature that enables users avoid having duplicated content. It also guarantees that users get to have a clear operational process that automatically adjusts content. The link building process that the software employs stands as a content generation strategy that is discredited by Google and other search engines that have had their algorithms updated. This means that the software may generate content that may not drive the traffic required hence proving to be ineffective in the long run. As spun software can sometimes be generic, it means that readability is often one aspect that a user has to worry about. In this case, so much time is usually spent in refining the content to ensure it is authentic and in a readable manner and this requires time and resources. The best spinner offers a unique aspect of spinning content but can easily land a user into trouble with search engines most notable Google since penalties are usually incurred by any posts that appear as spam texts including low-quality linkages.